Lost Season 3: "Stranger in a Strange Land"
But Jack does manage to keep Juliet alive, thanks to the guilt he feels because she saved Sawyer and Kate and because Ben has an infection and must "pay" for a doctor. Once again Jack is able to control the situation, but for how long? 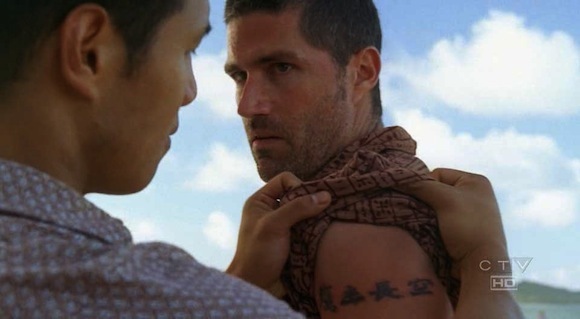 Through the flashbacks we learn where Jack got his tattoo on a trip to Thailand. A woman he meets has a gift of being able to see into people and put a tattoo of definition on them. Since he's on a trip to find himself, and is a man seeking definition in general, he forces her to give him one although as an outsider he's not supposed to. She tells him there will be consequences because he gets the tattoo, and he's kicked out of the country, quite literally. But I have a feeling she meant more than that. By defining himself, is he trapping himself, not allowing change within himself? Or by knowing so much about himself, will it cause more harm than good? Either way, the tattoo reads, "He walks amongst us, but he is not one of us." While this obviously applies to his time in Thailand, I think it has more to do with what she told him before she gave him the tattoo: he's a leader, a great man, but that makes him lonely. No matter what Jack does, he will never full be apart of any group, his leadership sets him apart. It's part of his path in life, but I don't think he's learned to accept this yet and is still fighting this fact about himself. Will it ever change for Jack? We will see.